Just checked into my hotel in Omsk and taking some time to relax and reflect on my travels over the past few days. It takes a while for memories and impressions to clear and coalesce. I generally write about previous journey during a current one. Then there’s the hassle of transferring the text to my blog page. I haven’t yet found an app to do that so I must do it online. I use WordPress to publish my blog but it’s a very fiddly service to use and even more difficult on a tablet. That’s why my blogs are late. If anyone knows a good android app to edit off-line and then publish self-hosted blogs, please let me know. Now that I’m moving further away from WiFi land, it’ll be harder to edit online but I’ll do my best, as always. I’m getting used to the Russian way of travelling, especially the bureaucracy. Actually, it’s a very rules-based society and far less chaotic than, say, Dublin. Things generally work very well and having a sense of this and also some experience now of how the rules work in practice gives me confidence in travelling and not getting stressed about missing the train, getting onto a wrong platform, doing something wrong etc. I got to the station in plenty of time to allow me to get some provisions and get settled in. Because the trains are so hot, I change into shorts and a tee-shirt as soon as I board. This let’s me feel cooler but is also less restrictive when sitting for long periods. Most Russians do similar. Long distance trains in Russia can travel several thousand kilometres on a journey. They stop at main stations to replenish supplies or something, not sure exactly why. These stops are usually 30 minutes or so but occasionally as long as an hour. I try to get to the station about 45 minutes before departure so I reduce stress and get settled in. It also prolongs the journey a bit, a bonus! I book accommodation based on the walking distance from the station. I use www.booking.com for this, a very useful service. I try not to have to walk more than 20mins with my pack although it’s usually only about 10mins. This time, the journey from Yekaterinburg station was only about 8mins or so; short and sweet, a bit like myself really. As I was waiting on the platform, I noticed 2 young girls who looked very western and had lots of country flags stitched onto their backpacks. As it turned out, we were sharing the same compartment. They were Australian sisters and on a slow journey home from Ireland, where they spent the past year. We shared some stories about Dublin but I was soon struggling to converse with them. Also, sharing a compartment with strangers is a bit challenging of personal space so I tried to respect their autonomy and privacy by not looking at them as they moved around and attempted to portray this by my body language. I was on a lower berth and they both had the upper ones and they scooted up there as soon as the train started and stayed there the whole journey whispering to each other. I noticed that they hardly looked out the windows at all. I reflected on how my counter-dependency and codependency has largely changed to independence. Most of the time. I wondered about the interpersonal dynamic in the compartment but didn’t really care what they thought about me. I remembered how this wasn’t the case for a long period of my life. The train departed at 10:15pm local time so we were all soon tucked up in bed and being rocked asleep by the motion of the train. I woke up about 7ish and did my ablutions with a wetwipe; start at the top and work your way down. It gives the illusion of a shower and I felt fresh, if not as a daisy at least as a pressed flower. 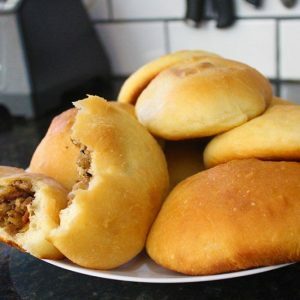 I had bought some pies at Yekaterinburg station and had these for breakfast hoping that the semi-tropical heat of the train hadn’t caused them to go off during the night. It hadn’t, they tasted ok. I wouldn’t say good or even fine and didn’t really want to know what was inside but it killed my hunger pangs. On a long journey, I enjoy standing in the corridor outside my compartment looking at the scenery and stretching my legs. It’s also a chance to see who else is in the carriage although I have given up on having conversations due to the language barrier. It’s nice to stand there rocking with the motion of the train and watching the great scenery go past slowly. Much more pleasurable that zooming by in a high speed train where everything’s a blur. Four young Russian soldiers were in a nearby compartments. I noticed them when they boarded but as I’m always wary of groups of young men, especially men in uniform, I didn’t make much eye contact with them. Well, as I was standing there in the corridor, one of them was dressed in shorts and a singlet and jogging up and down the corridor. We made eye contact and I nodded to him, friendly but not too friendly; you never know. He smiled back and stuck out his hand and introduced himself as Alexei. He wanted to practice his English and I was glad to talk to anyone, at this stage. I told him I was Irlandskiy and came from Dublin in Irlandiya. He said he was 26 and an officer attending an institute. I told him a bit about myself and my work and he was interested in PTSD or Afghanistan Syndrome, as he called it. He asked me had I ever been in the military and I told him about my time in the Irish Defence Forces. We started talking about guns and I told him I was in my company rifle team and we spoke more about guns. You know, guy stuff. He had a very direct gaze that seemed to contain no guile. Very congruent, I thought. I had noticed that about Russian people. Frequent, when they look at you they don’t just glance, they really look and take in what they’re seeing. As least that’s what I interpret. 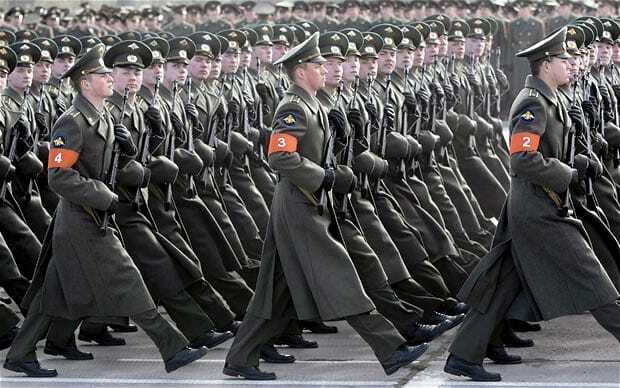 Then one of his fellow soldiers came up and Alexei introduced me to him, then another and finally the last one. He is our leader, Alexei said in a respectful tone. He looked like a character direct from an Alexander Solzhenitsyn book. He stood there smiling and strongly radiated authority and competence. I could see his platoon following him anywhere, in a war situation. None of them spoke English but Alexei translated. We started talking about hobbies and one of the guys was a boxer. I gave him an exaggerated salute and said ‘Sir’. They found this hilarious and this led to a bit of banter. The rest of them, apart from Alexei, were dressed in uniform, as we were nearing the destination. This was camouflage trousers, red and white striped tee-shirts and forage caps. They looked really smart. And as cute as buttons. One moment, during the banter, I was surrounded by them and we were all smiling and laughing. An image appeared in my mind of the sailor’s scene in The Naked Civil Servant movie with John Hurt as well as the Querelle movie. It was a delightful moment, innocent and haunting. And nothing else. I’m rooted enough in reality to know this and accept it for what it was. I smile now as I think about it. The train arrived in the early afternoon and we all embarked to go our separate ways. The Australian girls were staying on for another day’s journey. I found my hotel and checked in, had a shower and went out to ramble around Omsk and nourish my inner child, who was starving at this stage. The hostel was bright, modern and clean. I chose it because it was near the station and scored 9 on Booking.com. A respectable score. It was deserved. 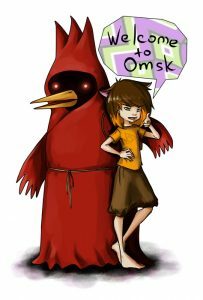 Winged Doom/The Omsk Bird is a series of drawings, comics and image macros, originated in 2009 on Russian imageboards, based on a central character of “Winged Doom”, a drawing by Heiko Muller. 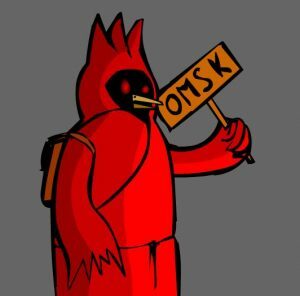 The character is often associated with the city of Omsk, and everything psychedelic, surreal and drug-induced. This meme is from 2009. It started as a phrase “Омич полуёбок, скажи ты наркоман? я просто тоже где то там живу, могли бы вместе уёбывать наркотики.” (“Hey, half-fucker guy from Omsk, tell me, are you a junkie? Because I live here somewhere too, we could shoot drugs together.”) The phrase itself was a forced meme on 0chan.ru/b, but the word Омич (guy from Omsk) quickly became an euphemism for junkie. Then the place itself became associated with everything drug-induced or surreal. 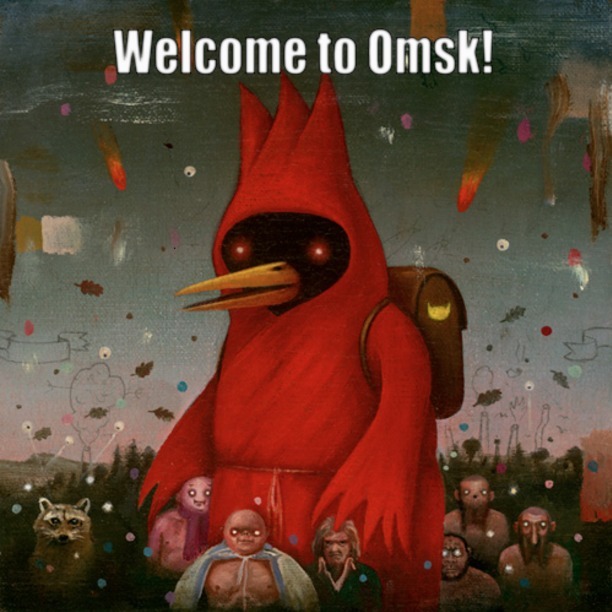 Various macros started to appear with “Welcome to Omsk” written on top of some surreal pictures like in “Picture unrelated”, and one of them featured the painting “Winged doom” by Heiko Müller. The recognizable central figure was dubbed “Omsk bird” and started to appear in fan-art. 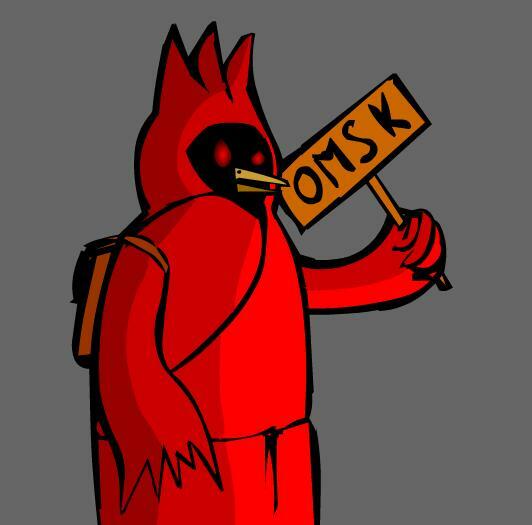 Heiko Müller became aware of the trend, initially misinterpreting it as if Omsk citizens have chosen it as a city mascot, but at some point he even participated in one of the winged doom threads. It is a curious trivia that the final version of stylized winged doom icon that is used in memegenerator was made by Heiko himself (he changed eye color from red to white). My hostel in Omsk was surprisingly reasonable. It scored 9.1 on booking.com from a few hundred users so the review could be trusted as accurate. It was. It demonstrated a very rare quality in the Russian service industry, customer service. I had booked a private room and was expecting to share a loo and bathroom, as usual. Not sure bit of it. I had my own bathroom with a powerful power shower so I could sandblast more of the grime off myself. And a table to write on. Even a heater as it’s getting a bit chilly here now. On one of my walks, I saw a monument in the distance, at the end of a lane. I followed the lane and came to a remembrance garden for the fallen in the Great Patriotic War. 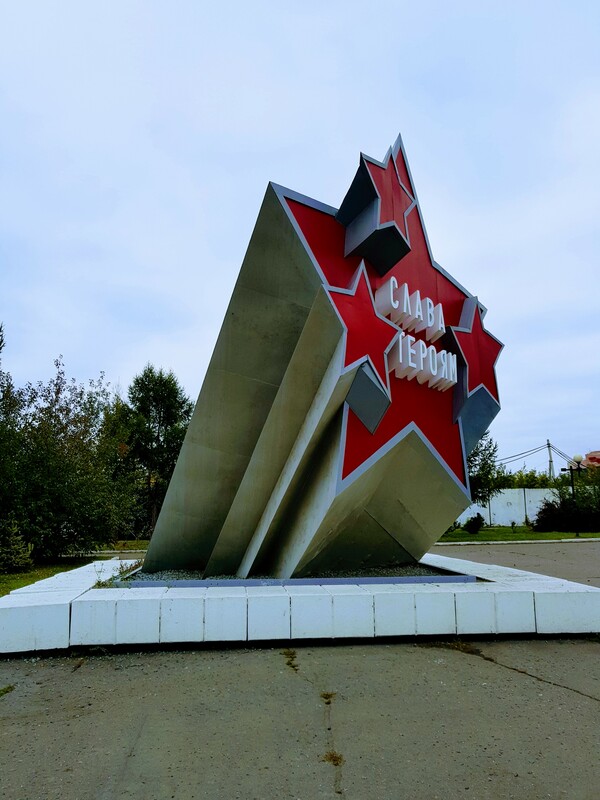 Like most things in Omsk, it looked like it was falling to bits. There was a long avenue leaving up to a central square where the monument was located. Despite its condition, there was no mistaking the solemnity of the location and what it stood for. 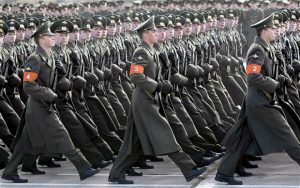 On both sides of the avenue were long banners of people, both men and women, with rows of medals on their chest and text underneath. All looked formidable and none of them smiled. I walked around the memorial park for a while constantly reminding myself to keep looking where I was going. This is not O’Connell Street with nice smooth footpaths. This is obstacle course city. I wasn’t watching where I was going and stood on the edge of a big hole in the footpath and my foot started to twist. My strong boots offered some support and I managed to ride it so no damage. But I reflected how much of a hassle it’d be if twisted my ankle and couldn’t walk. Catastrophe, not to mention that there wasn’t a decent hospital around. So, I kept my eyes open. I did a bit more walking around the centre of town and then my foot started to hurt again so I thought I’d catch a bus back. I had registered what buses left the railway station, the vokzal, so I caught the first one with this on the direction board. I had about 100 Roubles in small change and knew that in Russia bus fares are charged at a flat rate. I usually hold about enough coins in my hand and they please themselves. Then I know how much the next time. I usually pay the driver but this time there was no way to do this so I thought, at end there’s a conductor. There was in a way, a provodnitsa who sat regally on a raised seat with a curtain behind it. You go to them, they don’t go to you. She growled something at me and I shrugged lack of understanding, a common gesture for me here in Russia and held out my hand with the loose coins. She scowled and took 28 Roubles, about 0.3€. Not bad. I’ve noticed a lot of this in Russia where actual people do jobs machines do in the west. Something about the dignity of Labour from communist era, I guess. As they’re mainly babushkas, I’d guess women are more economically free here too. I got back OK, surprised at how far I’d actually walked. My hostel was just opposite the central station so I popped in there for a meal. More babushkas. I think I’m on the brink of a new scientific breakthrough. My backpack is getting lighter and the space inside is getting larger yet and I’ve discarded nothing, despite losing a pair of new specs, grrrr. I remembered this a few days ago as I was walking with my pack on my back to Yekaterinburg train station. I was going down the stairs of the underpass or subway to get to the other side of a busy road, and noticed that there was a decided spring to my step. This led to a memory of the first time I had the pack on my back just a few weeks ago as I was walking from my apartment in Dublin to catch the bus to the ferry. The pack seemed terribly heavy them despite my best efforts to keep weight to a minimum. I remember thinking, jaysus, this is going to be a right hassle. For the first few weeks, everytime I unpack and repack my bag I reorganise things a little bit more efficiently so that there is a little more space. All these extra bits of space add up and I now have plenty more room so I don’t have to struggle closing the bag praying that a zip won’t break or a seam come unstitched. The 6 packing cubes I mentioned a few weeks ago are a godsend and save so much time and hassle. Elimination of stressors is my new mantra. Also, as my body gets used to the weight of the pack and as I learn, through experience, how to adjust the straps so my hips are doing most of the work, so does the bag seem lighter. It’s actually heavier as I invested in a 20,000 mA/Hr battery pack weighing in a over a kilogram. This is because I was getting sick and tired of running out of battery power for my phone and tablet. This power pack means that I can be off grid for about versus and still use phone and tablet. A worthwhile tradeoff. The result of all this is that I believe my pack has more space and is lighter. And do does my mood and demeanour. OK, this is not science but, hey, why let the facts get in the way of a good yarn. Next stop is Severobaykalsk in Siberia where I leave the Trans-Siberian Railway at Bratsk and join the Baikal-Amur Mainline or BAM following a 2 day train journey. More about that later.